Please deliver to.....: Snaily maily revelations. Hmmm... When I think of you, I don't think of a whale - I think of a dinosaur. Can you eat a dino's weight in sushi? ... which is why I woke up one day and decided to keep only 12 regular penpals! No, there's no such thing as too much sushi. Especially when I can eat a dino's weight in sushi! No no, no need to worry... You ARE one of the chosen ones, of course! You're actually my number 1 entertainer, so what would I do without you?! Remember a time when I thought you were so innocent and polite?! Yeah, me neither... I know better now! I AM SO LUCKY. :D So lucky that I'm gonna do a lucky dance. *lucky dance* Join me, will ya?! Everybody look at your hands! I had this song in my head ALL DAY yesterday. I'd sing the lyrics I remembered, then ask Darcy what the next line was. He'd mumble something incoherent and absolutely wrong, and we'd do that every 10 minutes or so. OH JOY!! No matter what incoming or outgoing it is always amazing to see what you send\get all the time. You're hilarious! And I just love all your mail. I can relate to having to catch up with letter writing so much, I still have about 5 penpals waiting for an answer.. There are just not enough hours in one day, I tell you! That postcard/letter idea is so clever! No, there's just not enough hours in a day. Especially since you had such a great snail mail sunday! Wow, I thought I follow all the snail mail blogs around here, but I was wrong!! :) I love your blog, it really made my Saturday morning better and I think I might write a letter or two today.. I haven't been a good penpal lately and my pile is high as Alps..
You outgoing is always so pretty ^.^ Hopefully I'll get a chance to reply to you soon! Thanks Jennifer! I look forward to getting your letter! I love the letter-postcard or whatever you prefer calling it :) That's indeed a very good idea! I think I am one of those two people! But I understand, I'm just glad you got my note. I just got my first pen pals and my replies to each of them were over 10 letter-sized pages... and that was only three people. I imagine that when you have lots of pen pals that can be stressful. I hope you'll keep me on the list if a space opens up! Happy mailing! Stephanie from Rhode Island. Thanks for your understanding. And absolutely, you'll be the first person I write if a space opens up! :) I've been seeing your info card on other blogs (that's you, right? ), and I think they're so neat! Definitely awesome. Thanks for your understanding Roxy! I still look forward to recieving your card. Thanks for sending it to me. You're welcome! I'm happy to hear that you liked the mail I sent you and, more importantly, you have come to the correct conclusion on 'the great awesomesauce debate of 2012"! Gosh,it takes ages for my letter to arrive.......whenever you see the mailman you should search his pockets...don't trust this case! Mail out of Canada arrives at its destination so quickly! Mail *into* Canada dwaddles and takes forever. I think international mail is afraid of bears and geese. But don't worry, I'll get that letter from the mailman if it's the last thing I do! First yayee for GEEK flags! Second I am SHOCKED lotion didn't work... That's all I've ever used! Are we talking about a Chewbacca situation though? Oh and I swear I'm not stalking but I love your Blog and had to post about you on mine with a link back. Hope you don't mind! Cheers! I don't mind at all! Thanks for the kind words. Hahaha! Shaving is certainly a pain! When I lived in Argentina and had a job, I used to go to a specialist to have everything waxed. It wasn't expensive at all and the smooth skin lasted for a couple of weeks. Now, I have to rely on the razor and I hate it. My legs itch and sometimes burn after I shave them :/. I wonder if there's a special product that works wonders ... I'll let you believe all the other things you've mentioned are true, haha :p.
And awe, you got my little letter! ;D I totally understand about not having time to write a lot of letters. Years ago, I used to have a lot of pen-pals. I ended up having to choose the ones I really, really wanted to write to so I could write quality letters (so to speak) to my real friends. 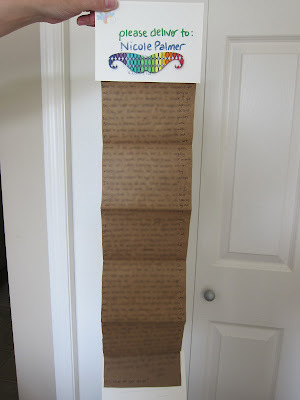 I dropped several writers who had awful spelling mistakes, hehe, and people who wrote a little note on a white piece of paper every now and then ... Did that make me a snob pen-pal ... Maybe, but there's only so much time you can use for writing letters!